Although we typically think of soup as veg and water we actually need to ensure it’s nutritionally balanced. Vegetables: this contributes as part of the carbohydrates especially if they’re starchy veg. Although you could also add quinoa or brown rice to bulk it out. Next you need to add your proteins and healthy fats. Your protein of protein can be gained from lentils, beans, chickpeas or peas. You can also add some extra chicken too. The fats can come from avocado oil (used for cooking), cheese or tahini drizzled on top. If you’re buying pre bought soup I recommend to watch out for added sugars. I mean who needs sugar in their soup?! 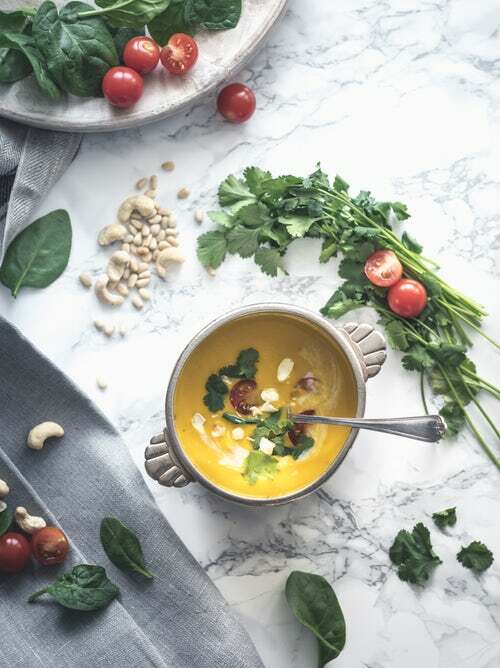 Soup is a great source of fibre (as most people struggle to hit the recommendations of 30g.d) and the perfect way to pack in your vegetable requirements. It’s easy, warming, delicious and easy to digest. I recommend bulk cooking a batch and then keeping it in the freezer for when you need it. If you’re super keen, you can make it using homemade bone broth to pack in the nutrients and for an extra collagen hit. Having said all of this you’re probably not alone if the idea of a bowl of soup doesn’t tickle your fancy. So let’s chat spicing it up…. How you can pimp your soup? ⁃ Add a dollop of natural yoghurt on top to give creaminess (and extra protein). ⁃ Top with some chopped fresh herbs, maybe some coriander on your sweet potato soup, or some basil on your tomato soup. ⁃ Make it chunky! Try opting for a chunky soup for some added texture. Alternatively, try adding a handful of fresh spinach or frozen peas in while your heating it. Hopefully this has given you enough reasons to jump on the band wagon and swap out those summer salads for something a little more warming this winter.